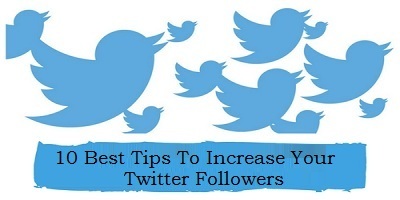 You might have read numerous blog posts on how to increase your Twitter followers. But, after reading this article that contains great actionable advice will make you the smartest in increasing your Twitter followers. But, I know that many of them are more complicated and are very lengthy and in-depth that you do have time to read the whole content and understand, especially it’s hard if you have other marketing tasks on your platform as well. So, here are 10 best short tips that will make it easy to understand and increase your followers on Twitter without much efforts. Can you think with local businesses as long as they're not competitor’s increases local visibility? Home-based companies by nature tend to support one another. So, you'll find that with the good foundation of local followers and you'll get more likes and retweets. Even if you're an internet based business you still live and work somewhere. People like to put faces with names and if you give your online presence and personality people feel like they know you and can relate much more easily. Everyone has brand loyalty from favorite sweatpants of the local coffee shop and you can capitalize their love to increase your followers. Write a blog post about another brand similar to yours but don't pick a direct competitor but choose someone whose client base translates well. Other brands appreciate your kind words and if they retweet the article to their followers soon enough those followers will find you too. Use this tactic to follow similar brands. Many businesses use the follow back technique it's the polite thing to do but it means that when customers use their brand loyalty to check out who is following who, they'll see that their favorite brand is following you. A lot of brands ask questions of the Twitter community you may think it's unlikely anyone will even see your response but if you click on a tweet from the web not mobile you can see public replies. This is your chance to sound smart and stay relevant by posting a way you reply or a helpful link. This tactic can increase trust among your peers in the online community you'll seem like you know what you're talking about and people will follow you because you've always had something funny to say. Again don't choose direct competitors but choose those with similar client bases or people who can relate to your brand. Don't bombard your followers with 5 tweets the more nothing the rest of the day. Spread your tweets out over the course of the day and automate posts, so you don't have to do the work. There's a lot of really great scheduling software to help you do this. You can always recycle tweets for new followers to see next week as well. Share articles from other brands in your niche, it makes you an excellent source of information people want and people will follow you for information on the latest industry trends. It also shows your followers that you value the opinions of other industry experts and fosters an environment of collaboration and respect. Getting recognition feels good mention individual authors in your tweets because chances are they'll follow you back. Use this tactic to call out authors at big companies - if they follow you and increases your exposure to all their followers and potentially their company's followers. You foster conversation to build a relationship with both parties in the reply and increase your chances of being followed by two thought leaders in your niche. Managing Twitter is no piece of cake but it's essential for marketers to have a good handle you have to keep an eye on what content they tweets. Building a good base of followers can help you grow traffic exponentially by using just these simple tactics. Wizugo [com] is hell bend on providing the best of the marketing and the automation services when it comes to managing the Twitter Account, even though it has these ads running on sometimes. But still, when compared to what I get in return, it is just a small part of the whole deal and I tend to focus on the positives. The feature which I like the most and which has also helped me gain about 23k followers on Twitter itself is the amazing content-recognizing sophisticated algorithm system which takes the best suitable tweets and tweet them on my board. I have also gained a lot of followers on my webpage too using this tool and for that I did not need to be on my PC all the time as it is mobile-optimised too making it easy to operate and manage anytime and anywhere.